The wheatear is one of our earliest summer visitors. In 2009 the first one was reported on Arran on 17 March at Clauchlands. The wheatear is a bit bigger than a robin, has an upright stance and in flight shows a conspicuous white rump and tail markings. The males are striking with a black mask, black wings, grey back and pale underparts. Females are not so bright and lack the black mask. It is the prominent white rump that gives the bird its name. The name has nothing to do with “wheat” or “ear” but is bowdlerised from “white” and “arse”. Over thousands of years its breeding range has expanded, and today two separate races visit the UK, each with its own migration route. This has been confirmed by birds that have been caught and ringed, including birds on Arran. 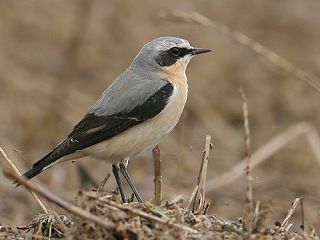 One race of wheatear stays in the north and west of the UK, including Arran, to breed. The other race just passes through during an amazing transatlantic migration. All wheatears spend the winter in tropical Africa, then head north in spring. Our race arrives in the UK during March. Males are first to arrive. Look out for them around the coast at this time. On Arran some move inland while others breed on the coast. By late April, the female has usually laid 4–7 eggs in a rough nest, often in a hole in a stone wall or rock crevice. The young are independent after about 30 days. Some parents then raise a second brood. The other race, known as the Greenland wheatear, arrives in late April. It is in a hurry to reach its breeding sites on the other side of the Atlantic, so doesn’t stay for long. It heads northwest across the sea, via Iceland, until it reaches the Arctic tundra of Greenland and northern Canada. By June, it has started to breed there. By August, most of our breeding wheatears are heading back south. But Greenland wheatears only leave their breeding grounds in August, so reach us in September – and sometimes even in October. Some bypass the UK entirely. They use strong winds to make a 30-hour, non-stop flight of 2,400 km (1,500 miles), directly from Greenland to southern Europe. All wheatears cross the Mediterranean to Africa via Spain. They migrate by night, relying on their fat reserves for energy. Many make a refuelling stopover in North Africa. Greenland wheatears, which fly furthest, put on more fat before leaving and spend longer at stopovers. Wheatears spend winter in a broad belt across central Africa from Senegal to Kenya.